Warning - this is a long one. Conventional table sugar is sucrose, and is purified from sugar cane or sugar beets. It is a disaccharide, meaning that it is a sugar molecule made up of two simpler sugars. It consists of a molecule of glucose bonded to a molecule of fructose; digesting sucrose breaks the bond. Thus, sucrose is effectively 50% glucose:50% fructose. HFCS is a product of processing corn, and is a mixture of 55% fructose to 45% glucose (the "high" fructose here is a mere 5% more), but not molecularly bonded together. Due to the complex politics of food subsidies in the US, corn is cheaper to grow here, and thus, HFCS is cheaper for food processors to purchase. America has a major sweet tooth when it comes to processed foods - HFCS is found in all sorts items, from soda to salad dressing and even processed meat products. Common media implicate consumption of HFCS (in any quantity) to coincident explosion in obesity and diabetes - and even cancer. Marketers have jumped on the increasingly unfavorable view of HFCS to remarket sucrose as a healthful alternative, leading to such things as "throwback" sodas, obfuscating the issue of increased total sugar consumption as being deleterious. See "manufactured demand". After all, fewer people profit when the message is consume less. And she comes to the same conclusion I did - that this is such a poorly designed and described series of experiments that really, the conclusions derived are hyperbole at best, and misleading at its worst. 1. HFCS affects the rats physiologically differently than sucrose, causing increased weight gain, even though the concentration of HFCS fed is less than the sucrose. 2. Male animals fed HFCS gained 48% more weight than those who didn't, comparing it to a 200 pound man gaining 96 pounds. 3. That the increased weight gain attributed to the HFCS even though the rats were fed a more dilute amount compared to sucrose, implying that HFCS calories convert to fat more efficiently. Okay, that's kind of tough to interpret. Let's just look at the first two experiments - here, the scientists started with a bunch of male lab rats, starting with an initial weight from 300-375g. Then they gave them food ad libitum - that means unlimited, or until the animal decides to stop eating. Essentially, let's give the rats an all you can eat buffet for 2 months. One set of rats just got water with the bonanza. A second set got 10% sucrose for 12 hours a day. A third one got 8% HFCS for 12 hours a day, and a fourth set got 8% HFCS for 24 hours a day. Here is already a problem with the design - there are three factors being mixed; concentration of sugar, identity of sugar, and period of administration. We can't tell their effects apart from this design. Okay, at the end of 2 months, lo and behold, the mice went from around 350g to 460g with an unlimited diet. Big surprise. Throw in some 10% sucrose 12 hrs a day, and the weight goes to about 480g. Change that to 8% HFCS, and whoa, it's up to 500g. So, that's considered significantly different, right? But if HFCS is made available 24 hours a day - wait, it drops to 470, no different that sucrose. That's a headscratcher, right? But the experimenters blithely move on - they state this conclusively proves that sucrose has no appreciable effect - and remove it from the long term study, where they extend exposure to six months. 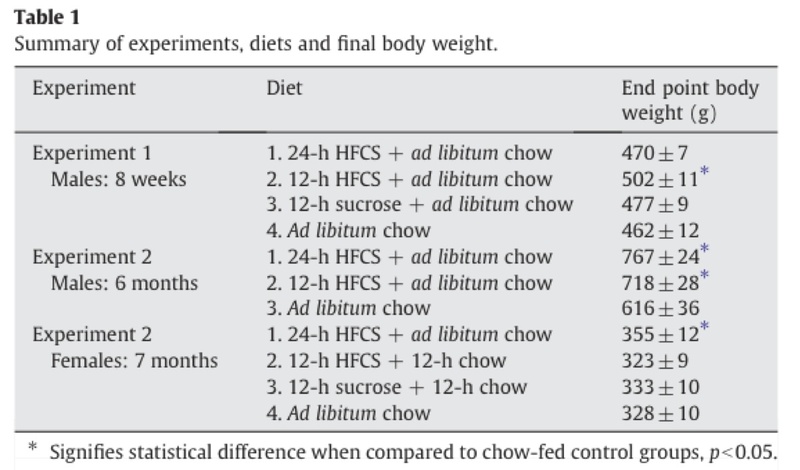 After six months of unlimited chow, basically, the rats doubled in weight with water, and with added HFCS to their diet they tack on another 100-150g of weight - huge by rat standards. But at this stage, the comparison with sucrose is moot. So, where did this 48% figure come from? 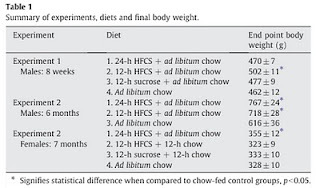 I think it's from the long term study, where rats essentially gained 250g more on chow alone, but with HFCS, they gained 400g more. Fudging the numbers a bit there, I can see how a 48% number can be derived - but the correct analogy is more like a 200lb man gaining 200lb without HFCS, and 300lb with HFCS - if they were eating all the time. The real problem being, of course, the unlimited diet, not the HFCS. The results from the female rats are even more confusing. I don't want to be it the position of defending HFCS, but I do want to defend good science, and studies like this besmirch the hard won reputation of well designed scientific studies, specially when it gains mindshare through press releases and congruency with running political passions. Bottom line - this study neither supports or debunks the contention that HFCS is metabolically different that sucrose in a long term dietary situation. It provides observations that can build new testable hypotheses, but that's it. Please stop spreading the mindjunk around.